Iʼve visited the GemSeal Plant in Atlanta, GA many many times throughout my life. I grew up in the industry here and made frequent visits with my father from as early as I can remember. But despite all of my exposure to the GemSeal brand and their products, Iʼve never once taken a “proper” tour of the their facility to see how they make their highly regarded coal tar based sealers. About a month ago that reality hit me and I decided it was time to get the inside scoop and share it with all of our pavement contractor friends at Paveman Pro. Our tour begins in the GemSeal testing lab. GemSeal is unrelenting when it comes to testing and retesting every element in their product from the very beginning up until their product is sold to the contractor. “We have very high standards at GemSeal.” Says Mr. Harry Carter, a well-known 30-year industry veteran and a regional sales director, who gave me the tour. “Our testing procedures make absolutely sure that every time a contractor leaves our facility with or receives a load of our sealer, they have the very best sealer we can produce.” Even using some of the highest quality materials to be found, they still check every raw material that comes through the door, every time it arrives. Itʼs here that the entire manufacturing process starts for GemSeal sealers and it is also where it ends. 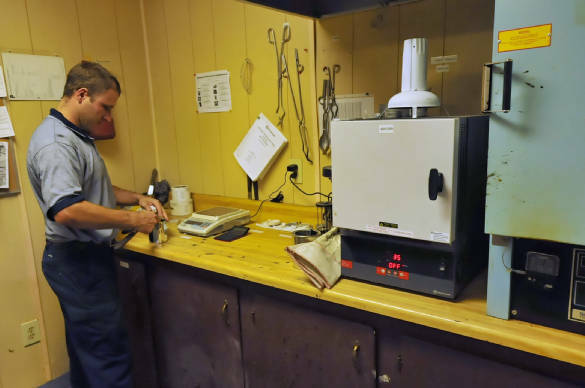 Whenever GemSeal receives a new batch of refined coal tar (RT-12), and before it is introduced into the manufacturing facility, they test to make sure the material meets their high standards and exceeds the governments (Road Tar) RT-12 specifications. This initial test they perform on the RT-12 is called a “Float” test. This test is designed to reveal the hardness of the refined coal tar. GemSeal requires that its suppliers deliver refined coal tar that exceeds the typical industry standards for hardness. “The reason for this high standard is because by having a harder refined coal tar you introduce several desirable characteristics into the final product, namely, less tracking, higher durability and fewer volatiles.” said Mr. Carter. While GemSealʼs suppliers have faithfully delivered quality RT-12 for decades now, GemSeal believes in “trust but verify” and continues to test every batch of refined coal tar that comes to their door. Once this gets the stamp of approval from their technician it is stored in heated, insulated tanks where it awaits to be introduced to the other components that combine to make up GemSeal sealer. 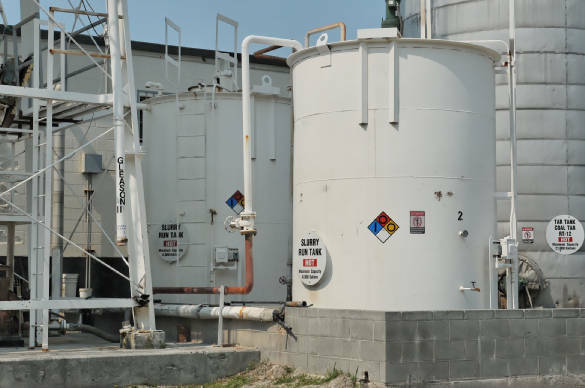 While the RT-12 is being heated to its proper temperature, the second major component of coal tar sealer is being produced, the slurry mix. Slurry is a combination of two different types of clay and water. One type of clay aids in the emulsification of the RT-12 and the other is to help cut down on the tracking and tackiness of the final product. Without these two clays the sealer would stay soft and never harden. They are mixed with water in large agitation tanks (see photo) and then sent to holding tanks where it is heated to 145 degrees. Now that the slurry mix and the RT-12 are stored and heated to their desired temperatures they are ready to be combined to make the final product. This is where the magic happens! As you see in the photograph all of the materials are routed to one central place (the green device in the center) and then output as sealer, the final product. This central unit you see everything routed to is the key to producing GemSeal’s quality product, the colloid mill. This “mill” contains a series of blades that cut and mill the material into ultra-fine particles. Both the slurry mix and the raw RT-12 are run through the mill and blended into one very stable product. The more stable the the sealer (or the separation and distribution of all the combined materials) the less “gunking” you will have. Put in practical terms, the finer the particles of each ingredient in the sealer the less clogging you will have in your distribution system, (i.e. pipes, filter baskets and spray tips) – and the better the material will protect the asphalt. 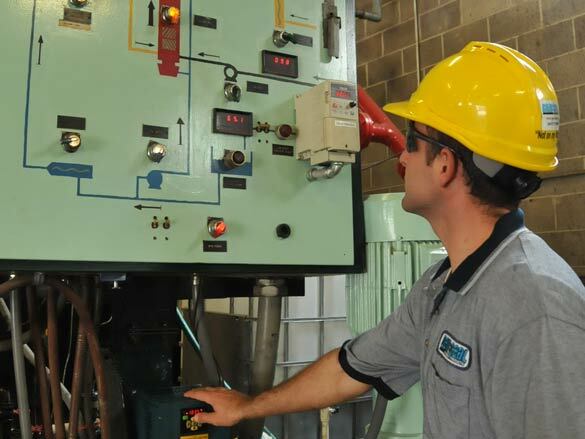 The control panel allows the technician to monitor and control the exact amount of gallons per minute that are introduced into the mill. When these materials meet at the mill the correct amounts of material are blended to create the sealer concentrate. 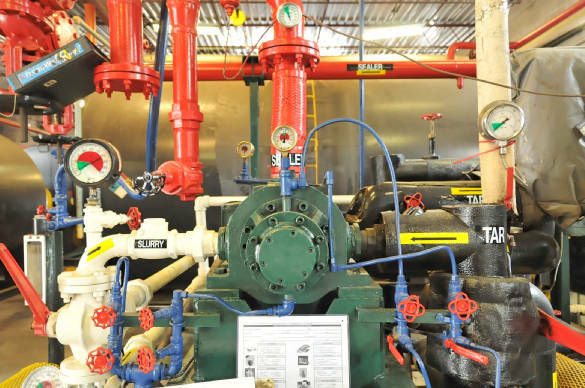 Once the slurry and the RT-12 blend together in the colloid mill they leave the mill where more water is introduced to make the final product (17% slurry, 34% RT-12, 49% water by volume). This mix produces a sealer that is 51% solids (slurry mix + RT-12). “ Again, just like with the raw material, GemSeal’s final product in Atlanta exceeds the federal specification of 47% solids by 3%. This higher solid rate also allows contractors to receive more raw material in their rig since there is less water in the final product.” said Mr. Carter. 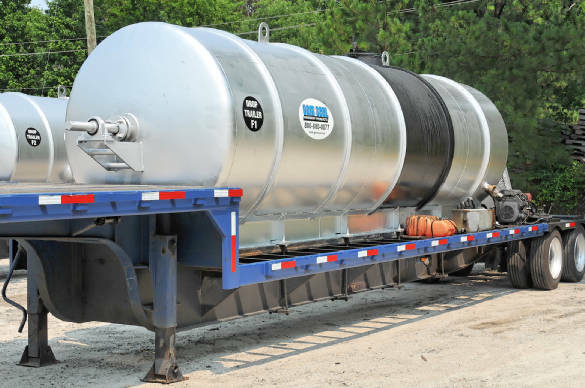 “This in turn allows the contractor to add more water later instead of them paying for and transporting a more diluted product from point A to point B.” After the contractor adds his own water the final solid content should be at around 38% when it is applied to the surface. Now that the final product is complete it’s time to deliver, right? Not so fast. GemSeal - being big on quality control - now sends the material to a series of holding tanks while each batch they produce is tested to get the final stamp of approval. In this final testing phase the Atlanta lab technicians are able to isolate each of the three major components in the sealer - slurry mix, refined coal tar and water - and confirm whether or not the proper ratio of each was used (17% slurry, 34% RT-12, 49% water by volume). Once this is confirmed the final product is given the stamp of approval and is sent to the “sales” tank to be sold to contractors either by pick up or by delivery to their facility. Beyond its Federal Spec High Solids sealer - which we describe being manufactured here - GemSeal offers at most of its plants 4 other kinds of pavement sealers that contain asphalt emulsion, additional additives and/ or sand. Each of their pavement sealers addresses particular needs and circumstances of pavement contractors. They also make proprietary latex additives to enhance sealer performance. I was very impressed with GemSeal’s process. They go to great expense and effort to ensure a high quality product is delivered every time to their customers. Indeed the GemSeal brand has become synonymous with quality pavement sealers throughout the decades. 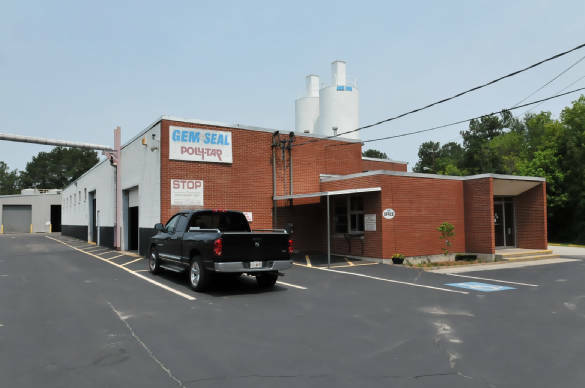 GemSeal invites any contractor to come in for a plant tour and see their unique process for making high quality sealers. You can visit the GemSeal Web Site at www.gemseal.net to learn more about their entire family of products produced at nine plants that supply the Eastern half of the US.